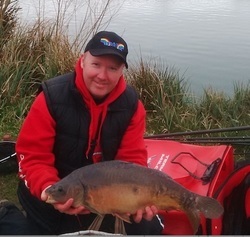 I'm Iain Swanson, a match angler currently living in Ebbw Vale, South Wales. I was first introduced to the sport by my father and late uncle who first took me fishing to the machine pond in a welsh valleys town called Brynmawr. Once I caught my first fish (a small Perch) I was instantly hooked and have never looked back. When I moved from Trefil to a village called Gilwern near Abergavenny this was then my fishing really started to gather momentum. We lived a stones' throw away from the Monmouthshire and Brecon Canal and during the school holidays I was fishing every day learning my trade. Fishing on the canal at the time was getting more and more popular and shortly Gilwern Angling Club was formed and started holding regular competitions on the canal. The second open match on the canal I entered I won it after bagging a great net of Perch and Roach on maggot I beat the seniors and the juniors at the age of 13 and won the first annual Carrington Cup. My match fishing then went from strength to strength and after a few years of dominating the club matches myself and angling partner Andy Neal went on to do well at the open match on the famous Gilwern Wood stretch. This at the time was attracting 60+ anglers a week from all over South Wales and was the real matches to win. In the early 1990's I was selected to fish for the Wales youth team and represented my country firstly in Southern Ireland on the Grand Canal and then the following year on the Shropshire Union Canal in Backford, North Wales. This match remains as one of my most memorable to date as I recorded two section wins out of two that helped my Team Wales to the team gold medal and myself winning a silver medal on weight countback.. It was certainly a special match for me and one I will never forget. I was asked to join Ebbw Vale Match Group after this match where thanks to my mentor the late Mike Brewer, I went on to learn about how to fish to the Drennan Super league standard on a variety of top match venues in the country such as the Bristol Avon, River Wye, Kennet and Avon Canal to name but a few. In my time with Ebbw Vale Match Group we had success in winning the Super league one, plus the Welsh national titles and various other Welsh league titles. My time with the match group gave me so much invaluable experience that would carve my way to the future. After the Match Group disbanded I remained close friends with a number of former team mates and we carried on fishing together on the Gilwern Wood opens where as a group of anglers became dominant and regular winners. Sadly the Canal matches started to drop in numbers with the rise in popularity of commercial fisheries, we continued to fish there until we were down to the last dozen or so hardy souls who wanted to match fish canals but I had to switch as knew that the future of fishing was changing. It was at that point where I started to visit commercials and basically had to learn it all again , it was hard work but necessary to be able to compete in modern match fishing. These days I fish a variety of venues some commercial and some naturals which seem to be given a massive resurgence of late. I class myself as an all rounder who is equally at home scratching for roach and gudgeon or bagging big weights of Carp. My current favourite venue is a lake called Hartleton which is just outside Ross on Wye, the fishing is a mix between traditional and modern with skimmers and roach the targets with modern methods. The other matches I fish now are opens on venues such as Woodlands View, Holgan Farm, Port Talbot Dock, Manor Farm, Hartleton plus a few club matches with Iffers Angling club who are a great bunch of guys and a great club to be a member of. My ambitions for the future is to keep fishing and to represent Wales (or Scotland!!) at Senior level and to keep the passion for match fishing I have always had. I am also now working in the angling trade, a career that I have always wanted to pursue! My new business is called Fishing-IT and we are distributors for Milo Fishing Tackle throughout the UK and Bait-Tech in South Wales. Whatever you do and however you fish I hope you enjoy it as much as I do! !